Whether you’re hosting four or 14 guests, a beautifully set table is a must for creating the holiday mood. 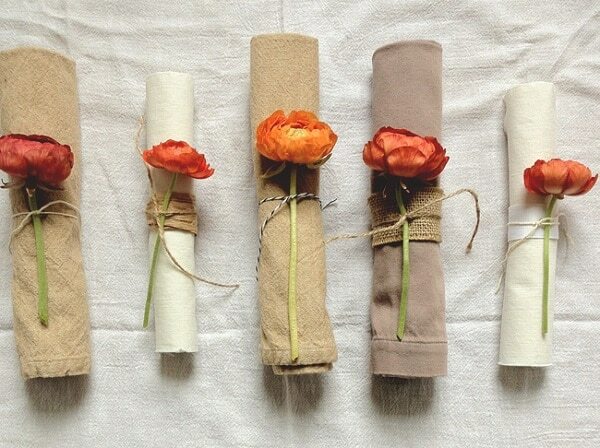 And napkin rings are the perfect way to add a little DIY flair without exerting too much time and effort. After all, you’ll need to save your energy for the kitchen! 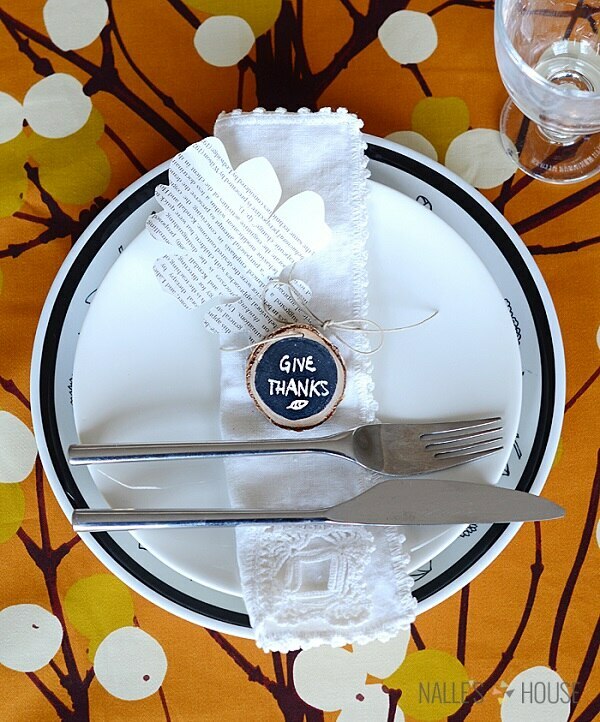 Napkin rings are simple, stylish, and an easy way to personalize your Thanksgiving table. 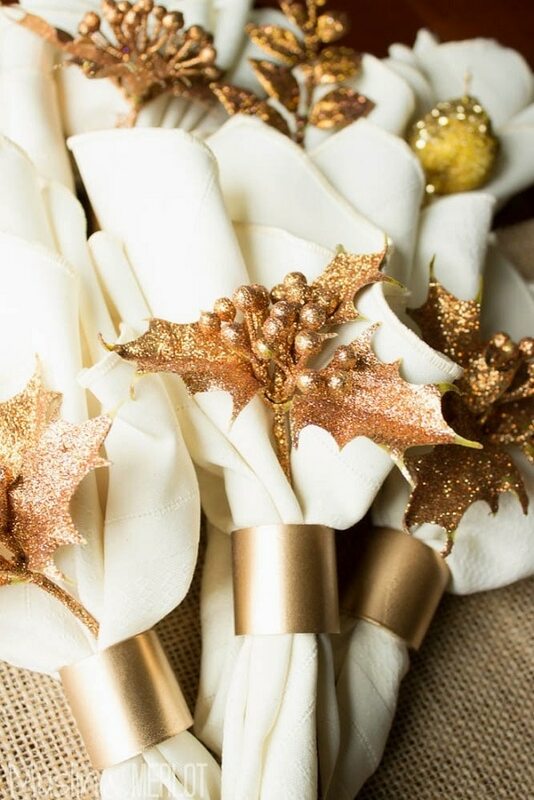 Whether you use faux flowers, feathers or beads, these tabletop accessories will set the tone of your holiday tablescape. 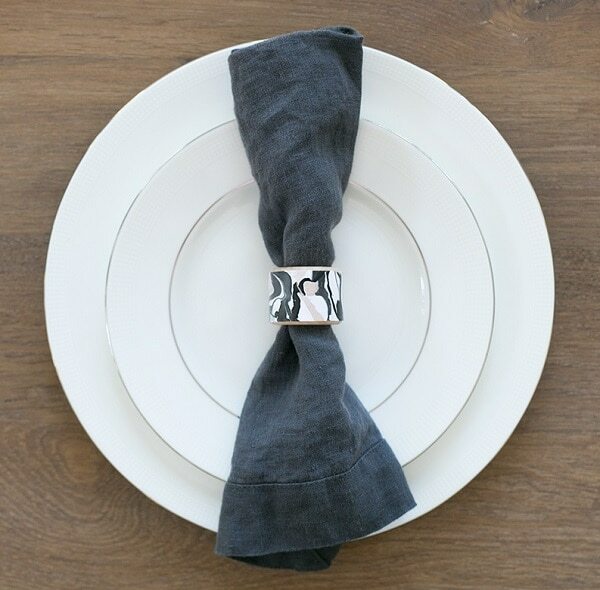 Let us know which of these DIY napkin rings is your favorite. These stylish square rings look especially beautiful when stacked. To make them, cut squares from clay, and stamp out circles using a bottle cap. Once they’ve dried, add a coat of shiny metallic paint. These marbled napkin rings are actually paper decorated with watered-down nailpolish and adhered to wooden ring bases. Black and white is classic, but you could get colorful too. These minimalist rings are made from wood veneer edging. They require some skillful maneuvering with an iron, but you can make a full set in less than an hour. 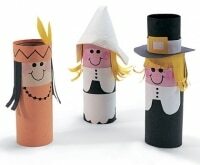 Evoke the holiday spirit with messages of thanks. 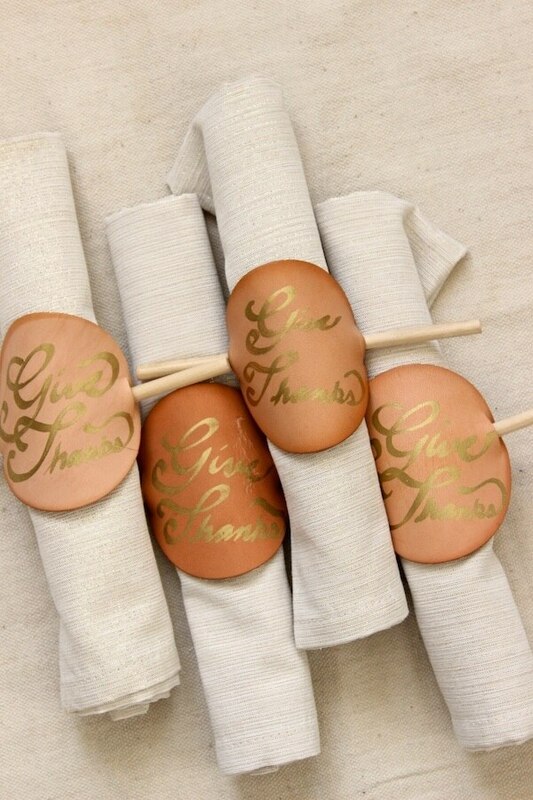 Use a gold pen to write them on pre-cut leather circles, then cut two slits for sliding a dowel through so napkins will fit snuggly inside the cuff. No one will guess that this classy decor is made out of PVC pipe. 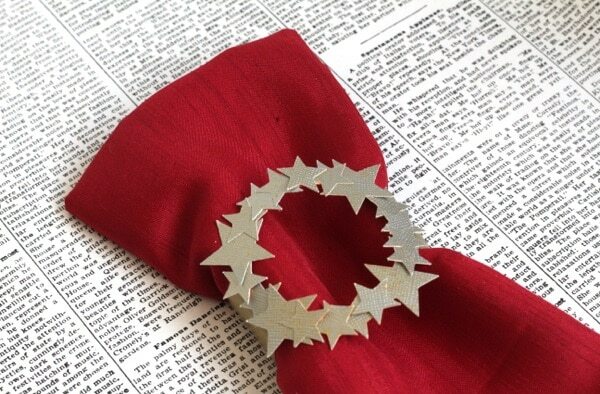 Metallic spray paint instantly fancifies. 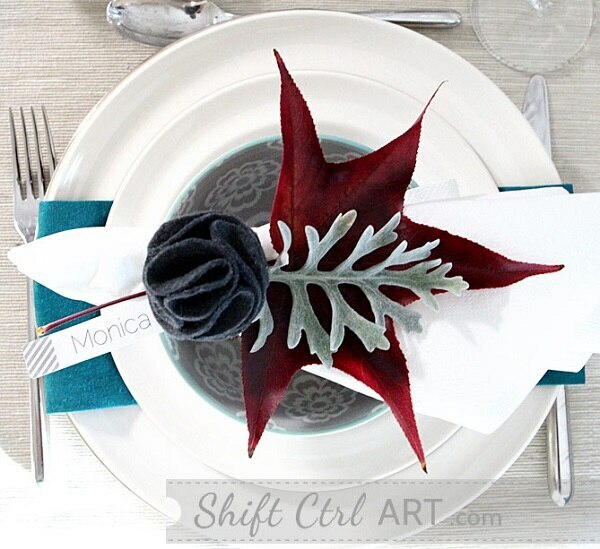 Wood slices become charming napkin ties with a layer of chalkboard paint. 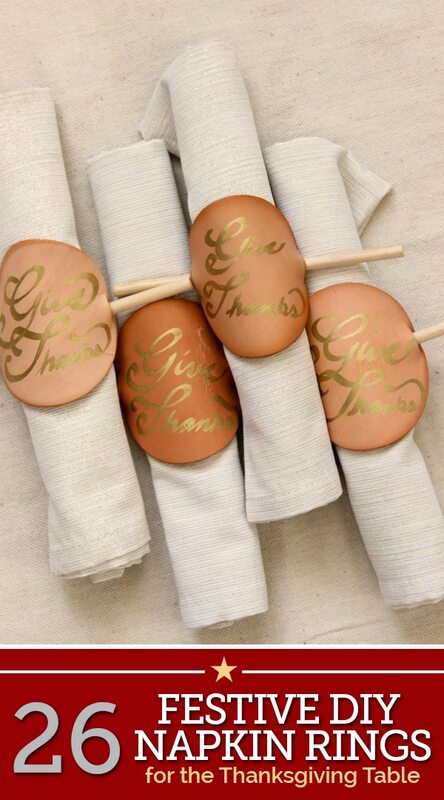 Scribble messages of thanks, or use them as place settings and write out guests’ names. 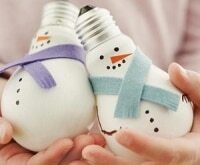 And in a few weeks, you can repurpose them as tree ornaments. These little leaves are made out of air-dry paint and leaf cookie cutters, then finished off with a layer of paint. A glittery ribbon pairs beautifully with pastels. This black and white birch pattern is both modern and natural. To make these rings, Mod Podge a photograph of birch (available for download, or take your own) onto wooden rings. 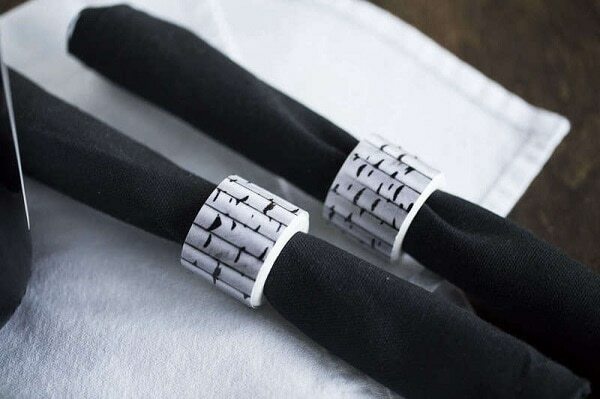 Can you believe these snazzy napkin rings are simply cardboard and tape? To make them, bend cardboard strips into hexagons, cover with metallic tape, and you’re done. Go au natural with simply elegant flower decorations; all you need is twin, ribbon, string, and glue. 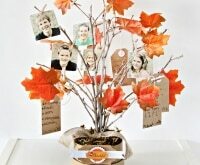 You could also use greenery or dried flowers for a more autumnal vibe. 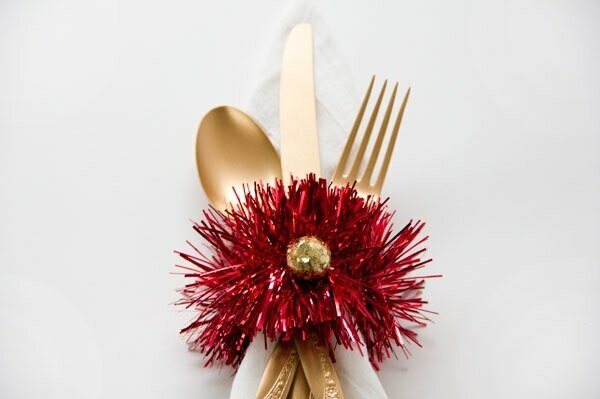 Wrap bits of a tinsel garland around cardboard tubes to create this festive and shimmery table decor. Leave as is, or top them off with metallic styrofoam balls. 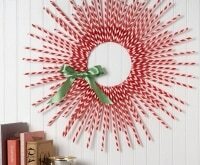 These mini wreaths are perfect for the holiday table, from Thanksgiving through New Years. To make them, glue paper stars to a cardboard base. 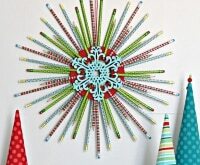 You can cut out stars using a special hole punch, or trace and cut by hand. 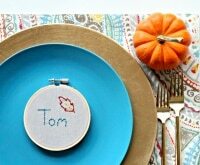 These stitched rings are a great project to do with the kids. 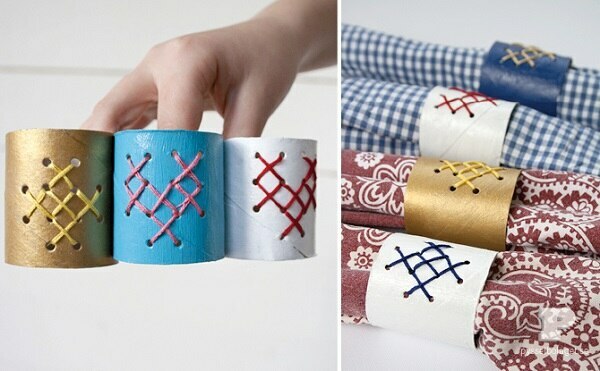 Simply paint cardboard tubes, punch holes in the desired pattern, then embroider with colorful thread. 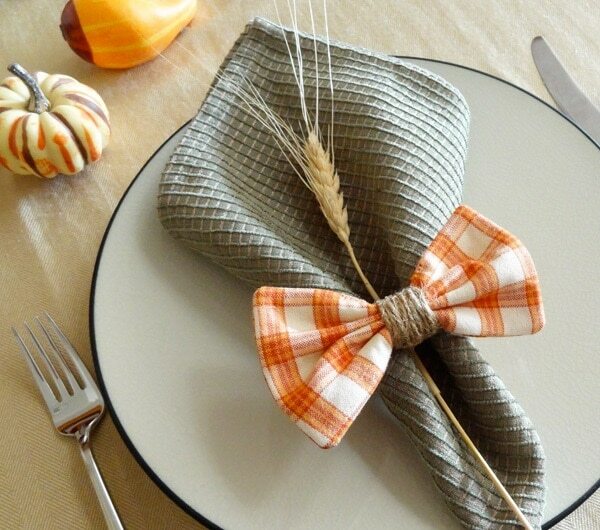 Give your table a rustic vibe with these charming bows in an array of different plaids. To make, wrap twine around the center of a fabric rectangle, and adhere to a braided base. 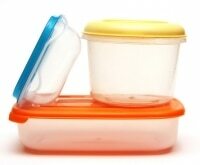 Make good use of those holiday libations- or at least their remnants. 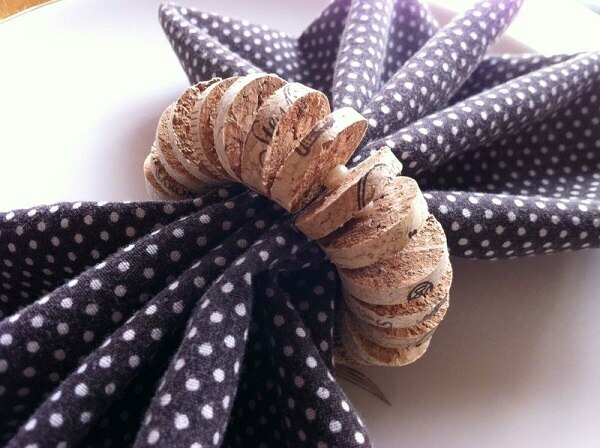 To make these celebratory napkin bands, slide sliced-up corks onto stretchy thread, alternating with beads. 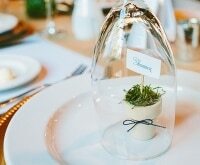 This floral decor is wintery and won’t wilt. Make a simple gray flower out of little felt circles that are folded and glued, then adhere to a natural-looking wire ring. To make the flowers into a Christmas ornament instead, glue the flower to a walnut and hang with string. 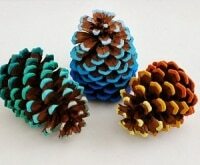 Glue colorful painted acorns to velvet wired ribbon. Metallic paint in different hues looks both fun and elegant, but you could also paint them all-over white or silver. 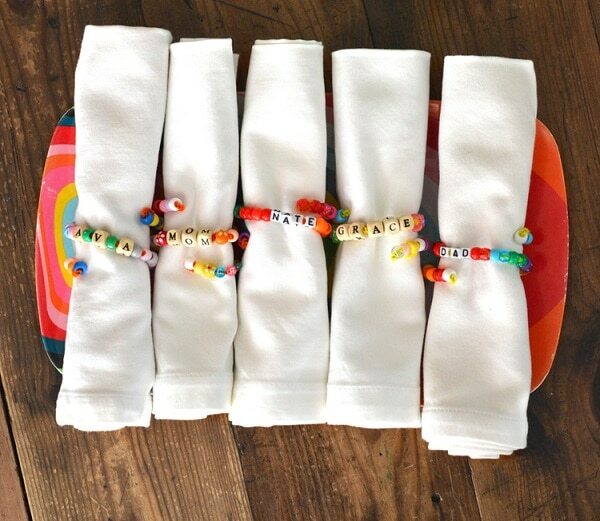 Kids will love helping to make these simple napkin rings out of pipe cleaners and pony beads, spelling out names or words of gratitude. To secure the ends, simply wrap the tips of the pipe cleaner around a bead. 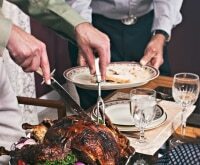 The turkey doesn’t have to be the only bird at the table. 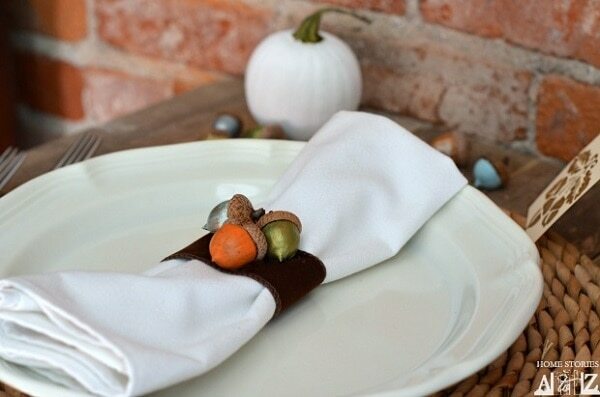 Feathers are the perfect colorful accent for a leather napkin ring. 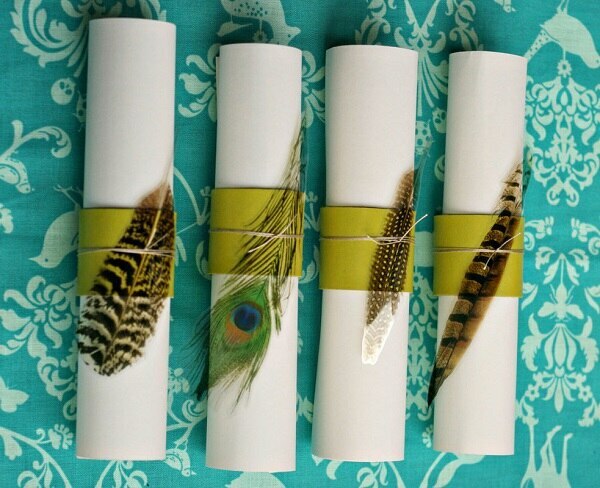 These are actually faux, but you could collect your own or buy a package at a craft store. 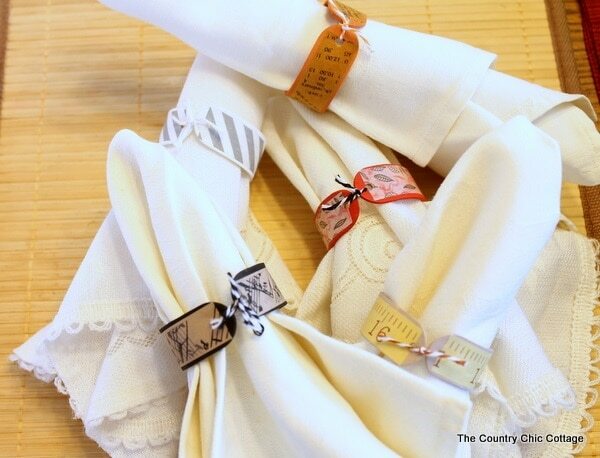 Simply thread ribbon through D Rings to create these playful but pretty napkin pulls. 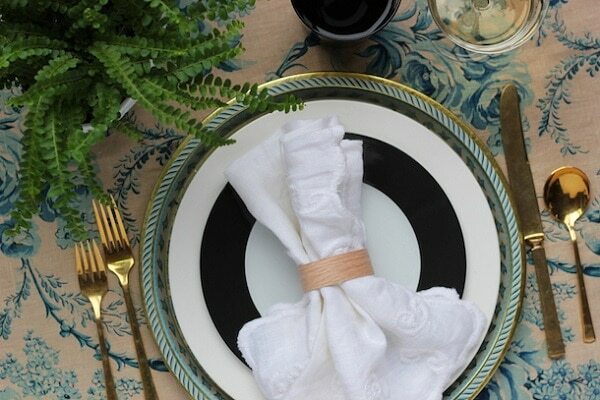 There’s an endless array of ribbon options out there to match your tablescape. 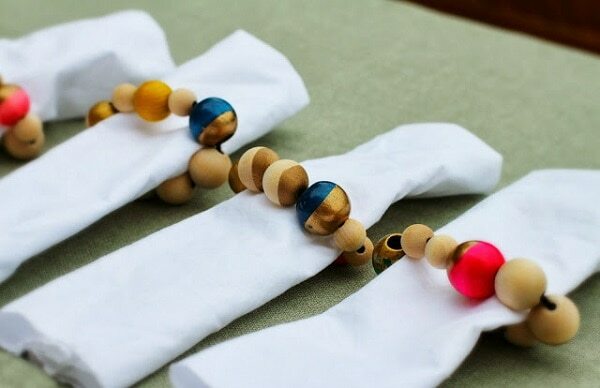 These beautiful two-toned wooden beads don’t need any embellishing. 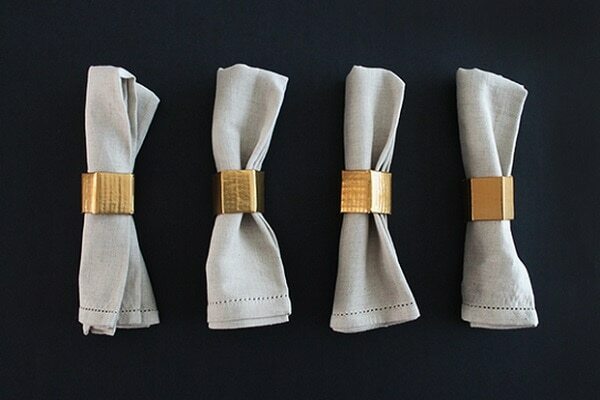 Just string them to wire to create artful napkin rings. 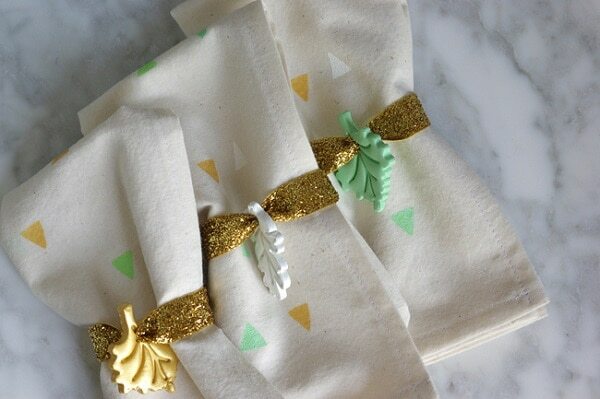 Turn scraps of fabric into these delightful little napkin wraps. 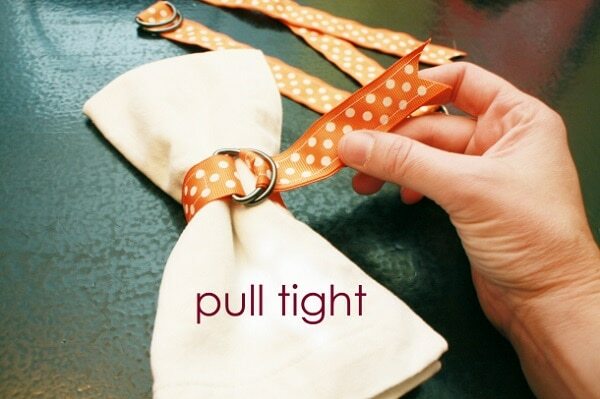 Use twine or fabric ribbon tied around a button to secure them. 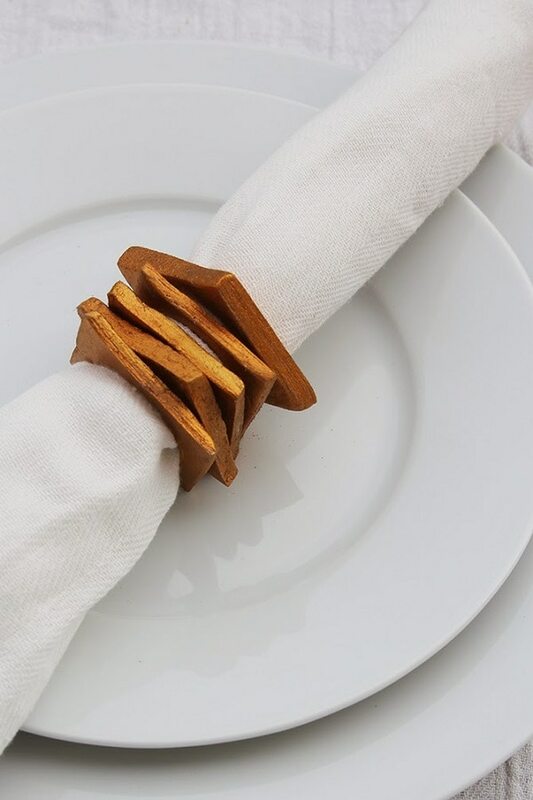 Boiling popsicle sticks softens them so they can bend without breaking, allowing you to transform them into circular napkin rings. Decorate with washi tape in funky designs like rulers and musical notes. 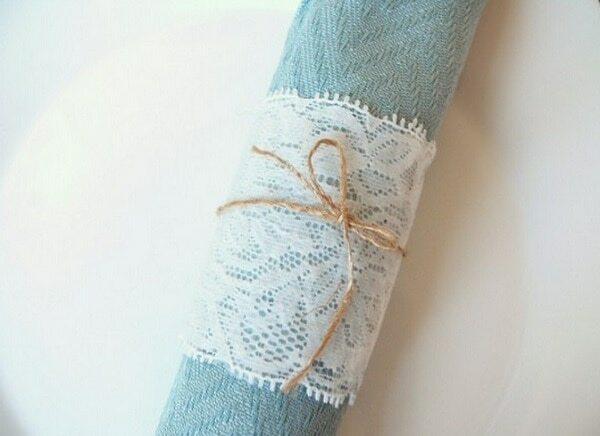 Classic lace is versatile enough to work at a wedding or a Thanksgiving table. To make these rings, simply wrap a piece of lace around a paper tube and coat with Mod Podge so it holds its shape. 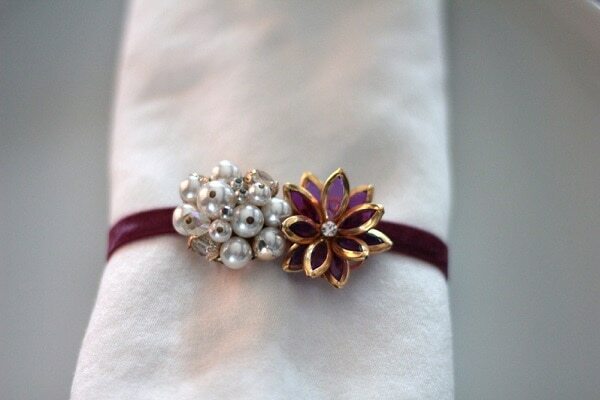 Oh-so-easy and elegant, these napkin rings are made out of vintage brooches and clip-on earrings, paired with velvet ribbon. No glue or paint required, just a pair of scissors. Who knew plastic bags could look so rustically chic? 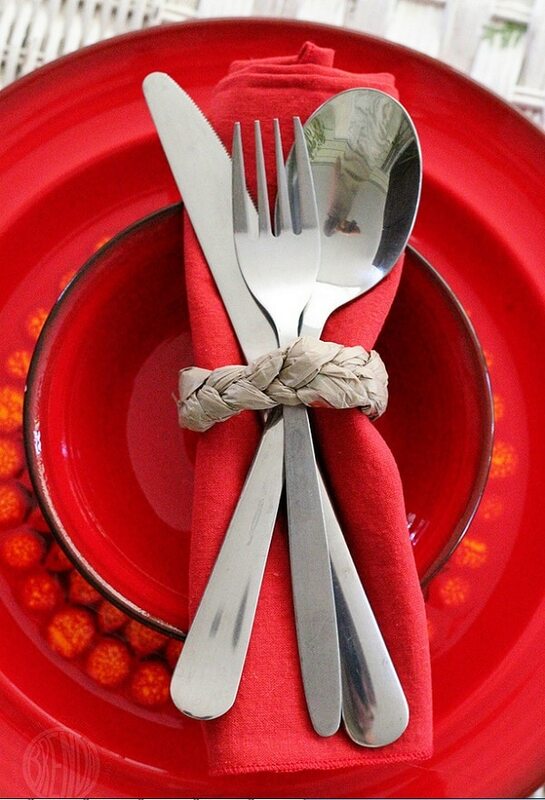 Just cut up old grocery bags into strips and braid them into these Challah Bread napkin bands.